With less than six weeks until Brexit day, May met European Commission president Jean-Claude Juncker hoping for progress on the "Irish backstop"
Prime Minister Theresa May headed back to Brussels on Wednesday to renew her quest to reopen the terms of Britain's Brexit divorce, but appears headed for disappointment. With less than six weeks until Brexit day, May met European Commission president Jean-Claude Juncker hoping for progress on the "Irish backstop", though EU leaders have insisted they will not restart negotiations. Juncker and May posed stffly for photos as she arrived at commission headquarters but did not shake hands, and shortly before the meeting the former Luxembourg PM repeated a warning that he did not expect a breakthrough -- despite more encouraging noises coming from Downing Street. Britain's Foreign Minister Jeremy Hunt warned earlier in the day that progress on the thorny problem of the Irish border is the "only way" to avoid Britain crashing out without a deal on March 29. May meanwhile suffered a fresh blow to her authority at home when three of her MPs resigned from her Conservative party in protest at her Brexit strategy to join a new independent group of lawmakers. 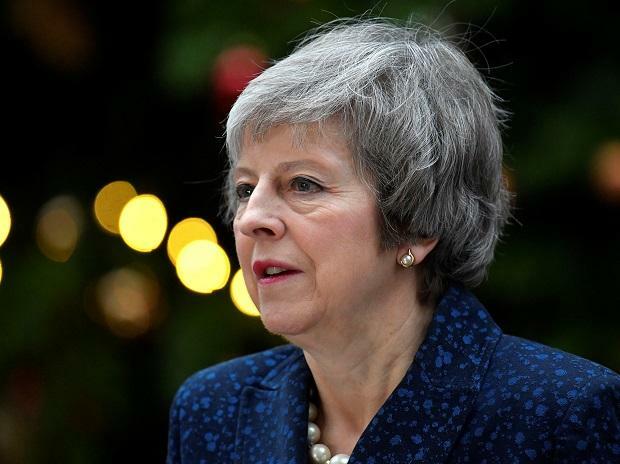 May and the other 27 EU leaders approved a Brexit withdrawal agreement at a summit on November 25 last year, but the British leader's own parliament rejected it overwhelmingly on January 15. May will try again on Wednesday, but on this trip she will not even meet Donald Tusk who, as president of the European Council, represents the leaders of EU member states. She will instead meet Juncker and Barnier, who have no mandate from Tusk's council or EU capitals to renegotiate the deal, or to modify the "Irish backstop" clause. This provides for Britain to remain in the EU customs union until a way is found -- such as a future free trade deal -- to ensure that Ireland's border with Northern Ireland remains open. Brexiteers in May's own Conservative party see this as a "trap" to keep Britain tied to the bloc indefinitely, and have demanded a time limit or exit clause. "We cannot accept a time limit to the backstop or a unilateral exit clause," Juncker's spokesman Margaritis Schinas told reporters on Tuesday, reiterating the longstanding EU position. This represents a direct rejection of May's core demand. May's spokesman said the prime minister was "working hard to secure legally binding changes" to the backstop that would win a majority in parliament. The spokesman said Brexit Minister Stephen Barclay and Attorney General Geoffrey Cox would be having further "detailed talks" with Barnier in the coming days following May's meeting with Juncker. Opposition Labour leader Jeremy Corbyn will meet Barnier on Thursday, while officials in both Brussels and London have played down talk that an EU-Arab League summit in Egypt this weekend could become a "Brexit in the desert" meet, insisting the issue would not hijack the gathering. A European source said Cox, whose legal analysis of May's deal confirmed Brexiteer fears, will have a have a key role to play. If Brussels does enough on the backstop to persuade Cox to soften his advice, it could help swing the parliamentary arithmetic behind the prime minister. Without a deal, Britain is due to leave the Union abruptly after four decades on March 29, with no follow-on agreement or transition period to manage trade and economic relations. Both sides have said they want to avoid this, and many experts foresee economic chaos, even warning of food and medicine shortages or a renewed threat of unrest in Northern Ireland. Manufacturing supply chains could be disrupted, and Brexit uncertainty has already been cited as a contributing factor in the closure or departure of several British-based businesses. On the EU side, the commission on Wednesday published an update on its no-deal planning, with seven out of 19 legal proposals to mitigate the effects now approved. Another option would be for Brussels to accord Britain an extension to the March 29 deadline, although May insists she will not request a delay. A delay could keep Britain inside the EU for May 23-26 elections for a new European Parliament, which will start sitting from July 2, presumably without any British members.